Steven (Chicagoland, United States) on 30 September 2011 in Landscape & Rural and Portfolio. Poodle Rock located in Valley of Fire State Park in Overton, Nevada. Easy to see how it acquired its name - good shot. I thought it looks like a dog (before looking at your title)... Great find. It looks like one. My goodness, what a shot. My poodle will have the fright of it's life. and captured in the clear and colorful way we know from you. it is really like it has a face! great seen and captured! fantastic and interesting whims of nature! great! It indeed does look like a poodle. Amazing rock formation with beautiful textures and colours. Well captured and presented. Tout à fait ... une magnifique tête de chien. The title fits fantastic! Great shot! 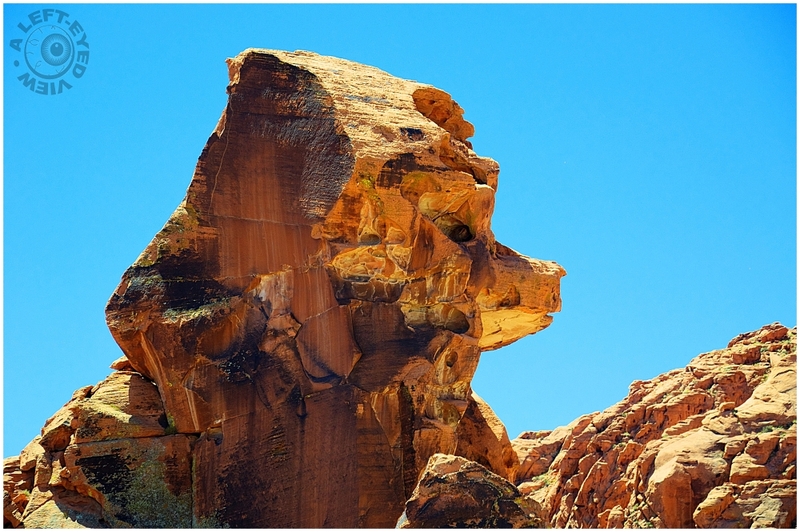 Great name for the rock and interesting shape of a poodle, beautiful light and colors! Aptly named indeed! What a gorgeous chunk of texture and light you have presented here. Sure enough!! Look at that! Great angle, Steven and the light is perfecto man! Great shot! I can see where it got its name. Excellent shot Steven! However, I seem to see more of ram than a poodle. Very interesting stone structure. You just made a lot of great find there Steven. Beautiful. I like the series. Amazing structure and beautifully lit against the blue sky. Perfect name. As I scrolled toward the title I was already thinking it looks just like a poodle. Great shot. I think I will add Valley of Fire to my bucket list of places I want to see. What a colorful pooch! Love it.